Hello, city of a thousand minarets! Go for a solo explore, settle into your hotel room or simply sit back and watch the madness of Cairo’s traffic jams from a coffee shop before shimmying over to tonight’s welcome meeting. Time to meet your new friends! After breakfast, it’s over to Coptic Cairo for a meander around the area’s historic buildings. Then: check out the view from Cairo Citadel before getting your haggle on in Khan el-Khalili market. First up: a felucca sailboat ride and a culture lesson in a brightly coloured traditional village. Then: it’s all aboard our five-star cruise ship for a taste of life finer than the pharaohs could have ever imagined. This baby comes kitted out with a rooftop pool, a bar and plenty of sun loungers for you to rest your weary heads on. Oh – and did we mention you can also get involved with an optional camel ride or traditional Nubian dinner today? Come face to face with awe-inspiring Abu Simbel, presided over by four gigantic statues of Rameses II. After that, we’ve got a quick question for you: what’s cooler than Kom Ombo Temple? Answer: the fact 300 mummified crocodiles were found nearby. Heads up: the eye of Ra is watching you today as we pay a visit to the Temple of Edfu. Get acquainted with the falcon-headed sky god Horus, then kick back on deck and drink in the beauty of the Nile. 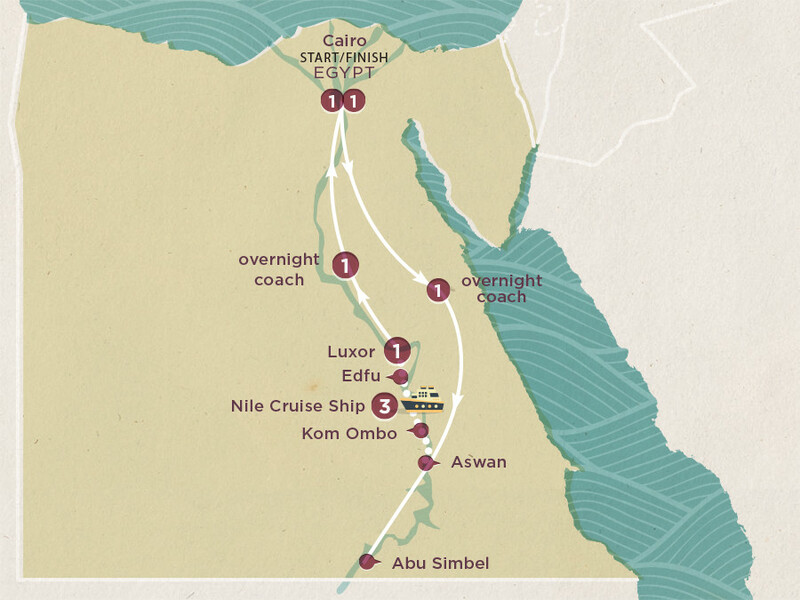 Today our cruise ship journey will take us to Luxor, which was once the capital of ancient Egypt. We’ll show you around Karnak Temple (the largest religious building ever made) and Luxor Temple, one of the best preserved of all of Egypt’s ancient monuments. Take a walk through the shadow of the Valley of Kings and pay a visit to the Temple of Hatshepsut before we hop on the overnight coach back to Cairo. Today we’ll check off King Tutankhamun’s treasure chest at the Egyptian Museum, see the legendary Great Pyramid of Giza (and the Sphinx to boot), AND take a whirl around the necropolis of Saqqara. What. A. Day. Shisha! Is the trip over already? If your inner explorer has been awakened, stay on to uncover more of Cairo’s coolness. We’re outta here after breakfast.